Make the night restful, not painful. Aches and pains can keep you up all night, but now they don’t have to. 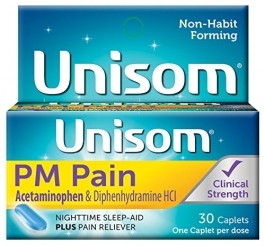 Unisom PM Pain combines the #1 Pharmacist Recommended Sleep-Aid Ingredient,1 diphenhydramine HCl, and the leading pain reliever,2 acetaminophen. This dual-action sleep-aid is safe, non-habit forming, and helps you get a deep, sound sleep. Unisom PM Pain takes the aches, pains, headaches, and sleepless nights away, so you’ll be rested and ready for whatever tomorrow throws your way.